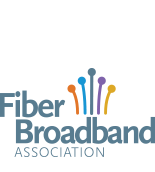 Welcome to the Fiber Broadband Association online newsroom. Here you will find links to our latest and archived news releases. Follow the Fiber Broadband Association on Twitter. These documents will download when clicked. They do not require a member or guest login. The Fiber Guide provides a comprehensive outlook on the fiber industry, fiber’s impact on the economy and communities across North America, and its importance for enabling the successful rollout of next generation wireless network technologies such as 5G. The Fiber Guide also includes helpful infographics and statistics on fiber deployment and its benefits for education, health care, real estate, and economic development.